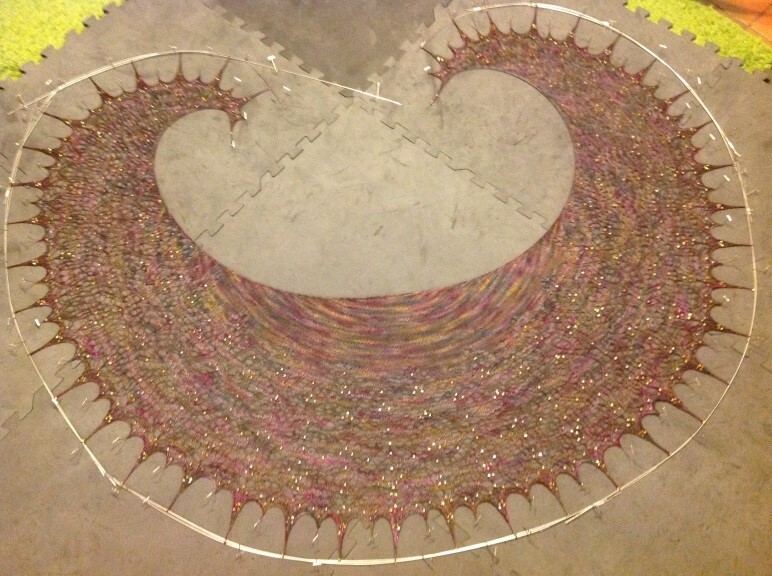 Lay your shawl on your blocking mats in an even curve – see photograph to the right. Pin the top edge into a gentle curve easing the edge so it is taut and with the ends of the shawl curving upwards and around. Thread blocking wires through the chain dangles (or the centre stitch of your point) and pin the wires pulling strongly. 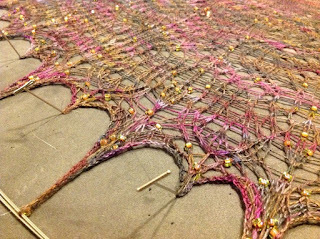 Make sure you leave plenty of space around your shawl as you will be removing your top edge pins as you stretch your shawl. Once your shawl is pinned out, take out the pins from the top so you get a nice even line along the top edge and pull on your blocking wires again, repining. Don’t worry if your mats curl a little, weight them down and stretch to capacity - I block like a thug and get lovely long points with great definition! Though you do need to make sure that your yarn will cope with such thuggery – some yarns are stronger than others. Should your shawl pattern show this in the finished photographs you can pull down the little points between your long dangles and pin to a short point (see photograph to the left). This is wonderful if you are using silk or a yarn with a high silk content, however, if you are using cashmere or a more fragile yarn than specified, you will need to be much gentler with your blocking. Wait until your shawl is dry, unpin, wear and enjoy!